If you’ve ever searched for photos of the Amish, chances are you’ve come across the work of Bill Coleman. Bill has spent decades capturing images of Amish in a remote Pennsylvania community. Many of the photos–of buggies, weddings, and the changing seasons–are simply stunning, while others–such as his portraits of children–reveal a closeness Bill has achieved with his many subjects over the years. I had always wondered how Bill was able to take such photos among a people that are as supposedly photo-shy as the Amish. Today we’ve gotten permission to share an adapted and enhanced interview (which Bill did for Nikon in 2009) in which he reveals that back-story. 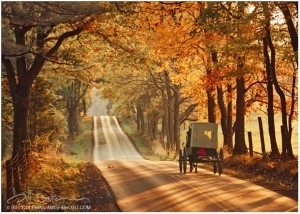 I want to welcome Amishphoto.com as Amish America’s newest advertiser, and to just mention that these photos,which come in a variety of formats and sizes, make great holiday gifts. Even if you aren’t in the market, I recommend visiting amishphoto.com to admire Bill’s impressive body of work. Recognized as the foremost photographer of the Amish, Bill Coleman has been photographing Old Order Amish families in a secluded valley in Pennsylvania for nearly 40 years. His work has been published in three books and numerous publications over the years as well as being exhibited nationally and internationally over the past 30 years. When first “discovering” the remote Amish valley and the families living there, Bill was an established and successful portrait photographer. “I had a pretty profitable business doing glamour portraits of Penn State sorority girls. I was booked three months in advance, and did about four sittings a day.” But part of him was looking for a change. “I was slowly getting burned out making people look beautiful,” he has said, “but I didn’t go looking for the Amish as a subject. I didn’t know anything at all about them. I came across the valley by sheer accident.” Soon he realized that what he was seeing and photographing in the Amish community was much more fascinating than the portraiture he was doing. When Bill first drove into the valley, he thought it might take a few weeks to photograph the Amish families living there. Two or three years came and went and he began to feel a need to continue to document the community, to preserve it in his pictures. “I think it is one of the last communities of Amish in this country that tourists have had very little effect on,” Bill has said, “so there is a basic integrity here. How do you get these pictures..are they posed? He says his pictures are the result of “luck and location,” that all he need do is stand in the right place at the right time. “I’ve always felt that there are two kinds of photographers—those who recognize that which was already established beauty, and those who can create beauty.” And because he doesn’t pose anyone, he doesn’t consider himself the creator of a beautiful image. What do you look for when you’re shooting and do you photograph other subject matter? He has a few things he likes to do. “I found that it’s much more meaningful and universal when you see a child from the back. When you see him from the front, you’re looking at someone’s child; from the back you’re looking at everyone’s child.” Collective gatherings are also a favorite subject matter that Bill looks for whether it be barn raisings, auctions or weddings; “these events allow me to capture the essence of Amish culture — cooperation, humility and mutual respect for one another”. The Amish aren’t Bill’s only subjects. He also photographs in Maine, and used to travel at least once a year to Europe. He photographs villages in Maine and Italy for the same reason he photographs the Amish. “I’ve watched values and society slide into a predictable package, and my photography of the Amish was an escape, a return to a basic reality. The Italian small town is the same…there is something exquisite about the lifestyle and the people”. “The challenging part is deciding what should be featured as there are so many favorites”. In addition, they’re coordinating national and international exhibitions of the photography over the next several years. One upcoming exhibit will be in Passau, Germany, a historically important city where the Anabaptists were imprisoned in the 16th century.” Noah said it would be kind of full circle for Bill as he too was a prisoner of war in Nazi Germany. “Whatever happens, we want to ensure that the work remains for future generations to see,” said Noah. Though in his late eighties, Bill remains active — still regularly shooting in his favorite Amish valley. “His casualty rate is higher these days due to his limited ability to get around, but his composition and sense of light still inspire,” Noah said. To learn more visit AmishPhoto.com. Went to his website. Beautiful photography. Very good post! 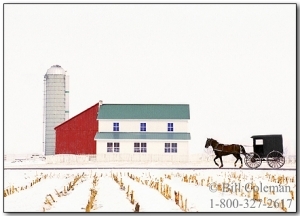 Thanks, Erik….and Thanks to Bill Coleman, to allow us “Englishers” a glimpse into the Amish culture. My husband is also a “retired” professional photographer, and last year in Lancaster, PA, we were most impressed with the beautiful countryside and the culture, that he kept busy capturing a lot of that on his camera. We now have a huge photo album on our coffee table, to remember our trip by. As always, in Amish country, we were careful to always get “back” shots of Amish, never shooting their faces, out of respect for them. I have enjoyed Bill Coleman’s work for years. I remember passing through State College, PA about 30 years ago and wishing I could live there! His photographs speak to Plain life in a realistic way. 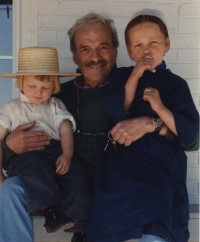 I am a Maine native, as well, so I have enjoyed the photos of the places I knew as a child and a young woman. Bill is my type of a photographer, capturing life as it is… from the backside. Always enjoy your Pinecraft photos Katie. I think Bill Coleman had the first Amish photographs I remember seeing when I first discovered them years ago. Without any Amish in the area, my glimpse of them has been few and far between. I appreciate the ability Coleman’s photographs have to transport me to the world of the Amish. Yes, and Doyle Yoder as well. I love his work … thanks for sharing this!! I discovered his work a couple of years ago and it is really inspired and inspirational. Somewhere online, there’s a video of him talking about it. I agree about photos of backs. My mother, who was an artist, always said that backs could be very expressive, and pictures of people’s backs often have such a contemplative mood about them. There’s a famous photo of Winston Churchill at work on his painting, and it captures his concentration (and unmistakable figure). I could stay at the computer for hours looking at Mr. Coleman’s Amish photography. I would love to buy one, but I’m afraid I would have to buy at least twenty – how could I possibly choose just one? This “backs” topic has given me some food for thought today. Okay, I’m going to catch myself trying to “read” someone’s back this week, I know it! Thanks for sharing, Erik, beautiful work!! I will have to save up to purchase one….we have lots of beautiful scenes here in upstate NY where the Mennonites and Amish live, many of those are so similar to this area! Such beautiful photographs! Thanks for sharing the link and the story! I love, love, love Bill Coleman’s work. I visit his website often when I need to be uplifted. His pictures of children in a natural setting have been hugely influential for me deciding to raise our children in a plain, farm setting. Also, I grew up working at Colonial Williamsburg, and I am fascinated by the clear links, especially in clothing styles, between the contemporary Nebraska Amish and the 18th century. I don’t notice this link when looking at any other group of Amish. Excellent post, Erik. The photos evoke a strong emotional response. Thank you! I have some first edtions Of Coleman’s books, one signed by him. They are quite pricey now a days; the older ones sell well over $100. I also have signed limited photos of Coleman including proof photos. I like the fact, that Bill photographs children, who look directly into his camera; there are very few of these around. Bill’s photography has helped me a lot about the Amish to satisfy my never ending curiosity about them. I am glad that you shared with all of us about Bill’s photography. I just clicked thru Bill’s work…absolutely breathtaking! I would love to have a number of those pictures in my home! Thanks for sharing Erik! 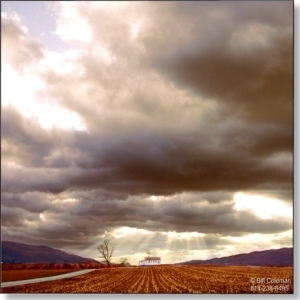 I once was invited to take photos of an Amish barn raising (white topper), who knew my husband. This Amishman wanted to have/see photos of his barn. We arrived early and discovered that Bill was there also. I got a video and lots of photos, and then contributed an article on the barn raising to a local magazine. This magazine called Common Ground is written locally and always has photos of the Amish. Most are contributed by amateur photographers, but have professional qualities. Check out their website for examples of their work and maybe get a subscription. Anyone reading this site of Erik’s will love this magazine. Okay, I’m going to have to add Mr. Coleman’s online galleries to my list of websites to visit on a regular basis. On first glance I really like the shots of people walking. I remember seeing Old Order people walking somewhere in Ontario Amish/Mennonite country, and thinking “wow, I wonder where their going” they seemed to be walking as a family, which was nice, maybe they didn’t go too far, sadly I don’t remember what day of the week it was, perhaps they where going to a church meeting. Mr. Coleman’s photographs are wonderful! One thing I noticed about this particular Amish community are the brightly colored fabrics used in the clothing. I don’t see Amish use these colors in Indiana and Illinois, at least not where I’ve been. Here in the Holmes County Oh Amish, we see alot of changes to what is allowed in colors of dresses anymore. Bright colors in the summer months, & I’m assuming they are probably New Order Amish or more liberal-I’m even seeing red dresses now which was never seen before. So looks like clotheslines have colors of the rainbow at times. But when visiting PA, I mentioned that to a Mennonite woman & she remarked “yes, we noticed the LOUD colors in Ohio Amish!” hmm-would flowers then be considered loud colored? Beautiful pictures, from Mr. Coleman-thank you for sharing Erik. Was wondering-have you ever done a post about the Amish Guest Books in their home? I just bought one for my daughter & her hubby, got the idea when I learned of Amish using them. Valerie that’s a great idea. In many Amish homes sure enough you will be asked to sign a guest book, which I love doing, mainly because of the chance to glance through and see who else has been through! At the schools as well. I wish I had a photo of a guest book though. If anyone has one and wants to send it to me to share, I think we could cook up a post on this topic. I found a nice one at the Christian Bookstore. It had a different scripture on each page. My daughter & her husband live in Hawaii & get alot of company from the mainland their way-so I thought they’d enjoy starting this Amish tradition. Thanks Valerie! No I actually just meant the cover or a view with no names visible 🙂 Thanks to your friend in advance and we’ll see what we can come up with. There is a picture in Coleman’s “Not to Offend” section showing a group of young men flipping the bird, in the image one man looks a bit like The Beatles John Lennon about the time of Let It Be, or whenever he was photographed wearing wide brimmed hats in the late 60s as a member of the band, it’s the young Amish man’s sunglasses and the hat that make him look like the ever popular rocker, though Englisher Lennon was bearded in the pictures I’m referencing and the Amish fellow is clean shaven. No disrepect intended I’ve just been on a Beatles kick all afternoon. In one of those pictures only one of the guy would not flip the bird. I have often wondered what was his thoughts and where is he now? As long as Mr Coleman is being respectful towards the Amish and their beliefs, then I think it is okay. I enjoy your website on the Amish and most of the time you accurately capture the nuances of their culture and society. I recognize how difficult it is for someone who was not reared as an Amish person to inculcate all of those nuances. However, 15 years ago I was quite put off by my first encounter with his first book (title forgotten). He claimed to have found a ‘hidden valley’ of Amish. It is not hidden at all, anyone who reads the Budget, knows where the Amish communities are located. But it adds a little mystery and intrigue to call it ‘hidden’. He claimed in the book that an Amish person whom he photographed in his buggy, disapprovingly called out, “you have stolen my spirit”. This is pure hokum. Primitive societies may have a fear that a camera will steal their spirit, no Amish person believes that. While the Amish are a very open and friendly people, it is not true that all of them “love the photographer”. 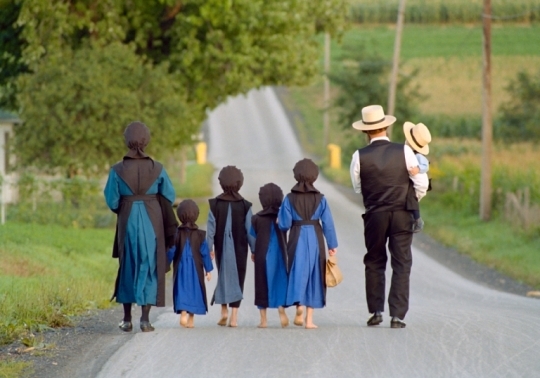 There may be marginal Amish who do not object vociferously, since vociferousness is generally disapproved, but the camera is an intrusion into their lives, and one should always be conscious of that when patronizing an “amish gallery”. What delightful insight into the artist and his ability to submerse himself in the Amish community. Pennsylvania lends for a gorgeous backdrop in photograhphs, and the Amish community adds to such a beautiful area of the country. We were not familier with Mr. Coleman’s work until this afternoon. My ten year old son purchased two matted & framed artists proofs, signed by artist, and gallery stamped on the back of the framing. He has recieved an extra American history lesson, as well as an art lesson for this Friday. The gallery has amazing works online and I have quickly become a huge fan of Mr. Coleman’s work. If anyone knows anything about these two pieces, please let us know! My son said he my even be willing to sell : ) a young entrepeneur at heart! Hi there, I was born and raised in state college. My favorite thing to do growing up was for my parents to take me on a long drive to Lancaster to look at, follow, talk to and of course go in their homes for the best part….to buy pies, breads and jams. One day i saw a boy and girl kissing and wished i had a camera! As I got older I started taking photos of the Amish but not in any competition with Bill Coleman who’s work hung in my families home for as long as I can remember. I have been lucky enough, on a few occasions, to go to his gallery and pick out a few originals as my parents did before me. What I love though, more than anything now, is knowing as my mom sits in a assistant living home in Florida is that her walls are filled with the photographs. It’s as if Bill knew that one day it would be my mothers memories of a life now gone. Thank you Bill. Karla, since alot of Bill Coleman’s pictures were taken in Big Valley, just over the mountain from State College, and you were so close to this area, didn’t you go there to see the Amish there? Not as touristic as Lancaster County, but very quaint with several good craftsmen and local stores. One thing unique to the Big Valley Amish is the 3 different types and the wearing of just one suspender by 2 of the groups, and no suspenders by the other white top buggy group. Alot of interesting features very different from the Lancaster Amish. Just wondering if you ventured over to visit their shops. Oh believe you, me….we went everywhere from over the hill and through the woods. My point was that I couldn’t get enough and would beg my parents to keep going. Many a weekends spent driving just to see more Amish people doing a days work or play. Loved watching them all come out of church. So many memories in my mind. Love them all. Glad to hear you ventured here also. The valley has so much to offer. Our bnb has a fanstastic view of the valley and it’s always a special Sunday for guests when our Amish neighbors have church. I feel so blessed to be able to experience their life every day! Makes one sit back and be thankful for the basics. I’m sure I’ve passed by your BNB hundreds of times. Lovely views you offer. I hope to make it back this coming Spring or Summer. 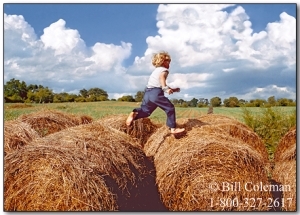 Bill Coleman’s photos of the countryside are breathtaking and he catches essence of the people perfectly. I used to live in Wisconsin and we had some Amish families near Shawano. One family helped us when our camping bus had a problem. We visited another family and they took us for a ride in their buggy. Both families were very friendly. I felt sorry that some people were prejudiced against them. The biggest complaint of these prejudiced people was how the Amish buggies were so slow on the highway. How small minded! These people are missing a great pleasure. Keep up letting others know about the lovely Amish. Not only do I love Bill’s work, but have been blessed in many ways having known him since my youth in the early 50’s when he first took photos of my family. Bill’s work is beyond comparison and captures a way of life most of us know nothing about. Of all the people I have known in my life, Bill is likely one of the most unique personalities I have encountered. A true human being and an eye only an artist can possess. You can admire his work as we all do, but to know him means that you truly get the fact that he is genius in so many ways. Thank you for years of memories Bill. Very much appreciated. How do I purchase the above photo of the mom Dad and five children walking down the road. I love this pic. Susan, you should be able to go directly to his website and purchase this photo. There are links to his site below. Susan, you should be able to go directly to his website and purchase this photo. There are links to his site below. Oops, just checked; go to www.amishphoto.com I believe Erik has the link on his also. This month they are donating 10% of purchase price to the Clinic for Special Children. Thank you, Erik. I just ordered the picture. Soooo excited. I collect Bill’s photos. Many years ago when I started to get interested in the Amish, and failed to find any photos of the Amish which would be of interest to me, I happen to come a photo by Bill Coleman. Through the years I’ve bought photos from Bill, he’s such a simple and great person! At one time I glanced through his catalog and came across a photo that I really liked but was sold out. When I asked Bill about it, he said remembered the photo. Much to my surprise, he wrote me back shortly thereafter and said that he decided to print more, and not only that, he sold me the artist proof! For those that have not seen Bill’s photos I recommend his photography very highly!